Where do I use my Sportsdirect.com voucher code? Select the voucher code you wish to use and copy it. 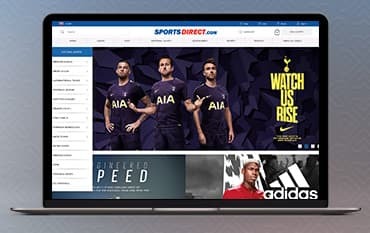 Follow our link to the SportsDirect.com website. Shop for your sports equipment or clothing as normal and add to your bag. View your shopping bag, then click ‘Secure Checkout’. Enter your delivery address and choose your delivery option and continue. On the Payment section click on the add promotional code button at the bottom, you will be taken to a new screen where you can enter your code. Your discount will be applied, enter your payment details and continue to place your order. "Huge savings available in the outlet and deals sections." "Sign up to the newsletter for great offers and deals." SportsDirect.com is a popular high street brand selling bargain sports clothing, footwear, and equipment for men, women, and children. Here you can find an expansive range of sporty attire to kit out your wardrobe as well as specialist items and equipment like football boots, yoga mats, skates, and rackets. As well as sports clothes you can also find a plethora of affordable kids clothing from big brands such as Character. Sports Direct also have a fantastic deals section with flash sales, special offers, and clearance products so you can save money on your purchase. If the product you’re buying isn’t on sale you can always use one of our voucher codes or offers to help cut the cost of your order. Sports Direct sell a huge range of footwear for all ages, including trainers from big brands like Nike, Adidas, Asics, Puma and Reebok. So, whether you’re shopping for comfort, practicality or style the collection of trainers at Sports Direct will have something that suits your requirements. At Sports Direct you can find an incredible selection of men's, women’s and children’s trainers for every season, from the latest fashion Nike trainers to gym bag essentials as well as best sellers from names like Lonsdale, Adidas, Puma and Airwalk. Here you’ll find ladies trainers perfect for jogging, sprinting or simply walking as well as performance boosting trainers for men as well. And of course, there’s also a fantastic variety of kids trainers, great for running, walking, training or cycling. The kids trainers stocked at Sports Direct come from brands like Skechers, Adidas, Nike, Puma and Reebok so you’re sure to find stylish, high-quality shoes that you and your little ones will love, including products that feature their favourite characters like Batman, Spiderman, and the Paw Patrol gang. Sports Direct’s extensive selection of football boots is available in styles to suit all surface types including artificial, indoor, firm and soft ground pitches. Sports Direct stock a range of football boots from top brands including Nike, Adidas, Puma, Warrior, and Umbro, with the option of MYiD personalisation for that individual touch. Find boots for men, women and kids; shoot like a pro and feel like a pro, whatever your style, or wherever you play. Footballers can find the best football boots from top-name brands here at Sports Direct, to give them that competitive edge on the pitch. For your ideal pair shop from the football boot ranges from Nike and Adidas with collections like Mercurial, Ace, X and Hypervenom, all of which include unique designs with performance enhancing features to help you play your best. Discover the Mercurial collection that features men’s football boots that combine high-speed control and lightweight explosiveness, ensuring an elite level of play at every step of the game. Designed for the attacking forward, the Nike Mercurial provides agility and speed for those who demand it most. There’s also the Ace range, designed for touch, feel and fit. This collection ensures superior traction and ball control, featuring a wide build that ensures both comfort and performance. Then there’s the X collection. This was created to allow quick cuts, unpredictable movement, and supreme stability, providing a rawness to change play. Last, but by no means least, there are the Hypervenom boots which tap into your deadly attacking instincts, ensuring maximum space ahead of the defender and a quick response that helps get your shots on target. Engineered for a barefoot-like touch on the ball, the Hypervenom combines agility and power to see you get ahead of the game. Golf is a hugely popular sport that requires a whole host of equipment in order to play. Buying all this equipment can be expensive but not at Sports Direct. Here you can find golf clothing and equipment for all ages and levels of experience for great, affordable prices. Have a look through Sports Direct’s extensive range of golf equipment and golf clothing including: golf shoes, golf sets, golf clubs, trolleys, accessories, golf balls and lots more from great brands such as Titleist and TaylorMade. You will find everything from polos, caps and visors, sock and belts to shoes and accessories like tees, bags, gloves, balls and umbrellas. You can also find a massive range of golf clubs including drivers, irons, putters, woods, left handed golf clubs, wedges and chippers, golf club sets and hybrid golf clubs. These are all available in sizes and dimensions that suit all ages and players including men, women and children. For savings on your golf equipment or clothing check out the Sports Direct deals section or browse our deals page above for all the latest money saving voucher codes and promotions. Standard UK delivery costs £4.99 and takes 4-5 working days, excluding weekends and bank holidays. We also offer click and collect for £4.99 which takes 5-7 days. If you choose this option, you will also recive a £5 voucher to spend in store. State on the invoice the reason for return and whether you want an exchange or a refund. Please note that we can only exchange items for the same product. Please use the online store finder to obtain contact details and opening times of your chosen store. Ask anyone with a passion for sport and they’ll tell you the same thing - the right gear can make all the difference. At SportsDirect.com, they share that passion, and through their online store you can get the right gear at the right price - even more so with our Sports Direct voucher codes. With huge savings of up to 90% off the RRP on big brands you can save yourself money and still look the part at Sports Direct. We are constantly on the hunt for first order Discount Codes for Sportsdirect.com to help you with your money saving. Our experts check dozens of sites for secret codes including NHS discounts, student sites & social media channels saving you time & money!